Jack-O-Lanterns are such wimps, they have no GUTS! 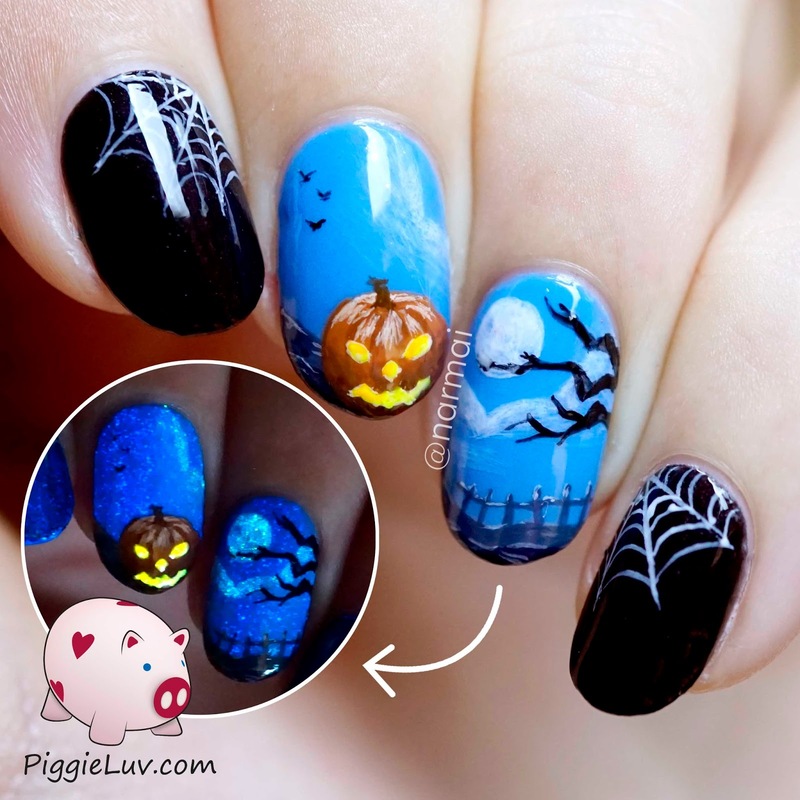 My nail art design is completely inspired by Just Nail It Peru who has MAD freehand skills. 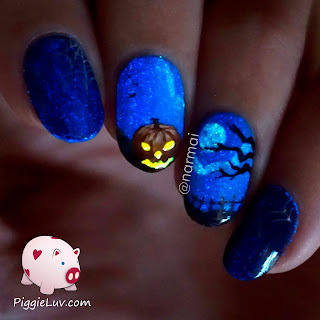 I used glow in the dark polish for an added effect though so mine lights up! And I made a video tutorial! Click to see more! I'm in a Facebook group called Hobby Polish Bloggers and we're all, like the name says, polish bloggers! It's a great group of ladies and we all share our tips about blogging, and we help each other out. We came up with the idea to do monthly link-ups with a specific theme. 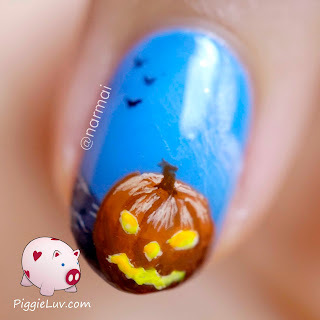 We've done Halloween, fall favorites, Christmas, 'New To You' (that one was a BLAST! ), Valentine's Day, St. Patrick's Day, May Flowers, beach themed, Starry Night and fall. 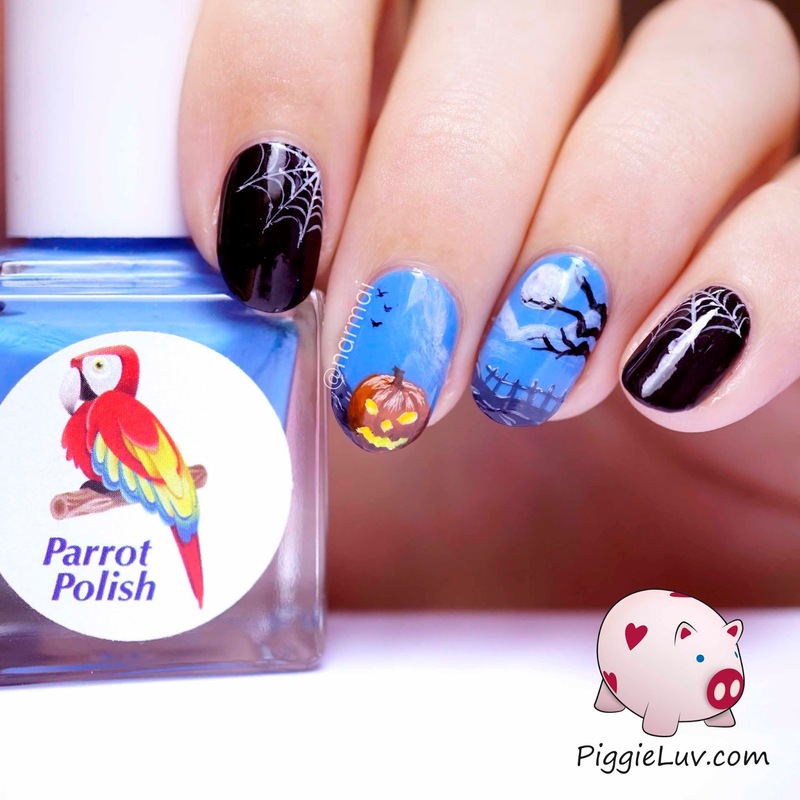 The background is Parrot Polish Linckia, the moon & clouds are made with Serum No. 5 Guiding Light and the eyes are creepified (yes I just made that a word) by Serum No. 5 Solar Power and a liiiittle bit of Orange You Sunny. The base for the spiderwebs is Serum No. 5 Lights Out which doesn't glow that brightly but still makes an awesome deep black base. My sincerest apologies for having two seperate videos. I was hoping to get both designs into one single video but my ancient laptop didn't agree with me and kept crashing at such a 'long' video... Instead of speeding it up beyond recognition, I decided to split the two parts into separate videos and that made all the difference! I received Parrot Polish Linckia, Serum No. 5 Guiding Light & Serum No. 5 Lights Out as press samples. I bought Serum No. 5 Orange You Sunny & Solar Power with my own money. Opinions expressed are 100% my own and not influenced in any way other than the quality of the product itself.